I was a co-author on a paper led by Chris Cvitanovic, on maximising the benefits of participatory research, which was recently published. Participatory research approaches are increasingly advocated as an effective means to produce usable science, that helps increase the likelihood that science will be beneficially incorporated into decision-making processes, and support positive real-world (societal, environmental, or economic) impact. The activities associated with participatory research many and varied, as is illustrated by this word cloud from Research Councils UK on Pathways to Impact below. Thus, the scientists who undertake participatory research often hold a unique set of personal attributes, expertise, networks, and drive to undertake research that spans the science-policy interface, compared to academics undertaking pure or non-applied research. Our paper is focused on the risks that climate adaptation scientists, their institutions, external collaborators, and funding agencies face when undertaking participatory research. Although we focus our discussion on climate adaptation science, the topics we discuss are broadly applicable to science-policy academics based in universities who are interested in achieving research impact across many disciplines. Career progression – current incentive systems in academia are largely dependent on academic achievements, such as the quality of their peer-reviewed publications and funding success, and far less on knowledge exchange or research impact related metrics. Personal wellbeing – increased process complexity, social dynamics of working with stakeholders, and the associated transaction costs associated with science-policy research (e.g., the increased time required to establish trusting and enduring partnerships to undertake impactful research), can impact on individuals’ work-life balance and wellbeing . This is particularly the case when universities are still getting to grips with what this type of research involves, and do not have the support structures in place to support this type of research yet. Integrity – dealing with contradictory perceptions about scientific integrity – on one hand there is the perception from other researchers within universities that applied, participatory research, is somehow less rigorous, or less “scientific”. On the other hand, external stakeholders can criticize many scientists for their science being too complex. As a science-policy academic myself, I believe the most fundamental strategy to combat many of the challenges that we outline in our paper is the need for far greater institutional support and leadership within university systems. This is the foundation to all other strategies that we highlight in our paper. We need academic institutions to not just talk about the value of achieving research impact at departmental and central university levels, but far more comprehensively invest in, and support, the individuals who are on the ‘front-line’ of working to achieve societal change and generating research impact. Train: provide professional development to support researchers seeking skills and experience to work across the science-policy interface. Support: provide financial, administrative and legal support for scientists that is both professional and efficient that helps science-policy academics confidently establish and undertake work with external stakeholders (e.g., to protect individual and institutional reputation, IP, the right to publish, and formalise participatory research partnerships). Promote: finally, and most critically, universities need to create positions dedicated to knowledge exchange and impact related research, and account for the unique suite of expertise and responsibilities that researchers have within impact related research, to support promotions and career progression for science-policy academics. Currently I believe there are few universities that achieve all three levels of institutional support and leadership. In the UK (and no doubt many other countries around the globe); promotion is a particular sticking point. A recent paper by John Hillier and colleagues, points out that impact related activities make a relatively minor contribution to promotion criteria for UK universities (with teaching and research excellence dominating). For those individuals who do stay in academia, impact related research tends to get drowned out by other research, teaching, and administrative duties (i.e., it is still quite rare to find dedicated science-policy academic roles in universities). This presents a serious issue for the new kind of academics focussed on impact related research, which many universities and research councils are investing in for early to mid-career researchers (e.g., through programmes like Knowledge Transfer Partnerships, Knowledge Exchange Fellowships, and Impact Accelerator Grants). Research councils and universities are investing in the start of a pipeline that is helping to create science-policy academics, but there are few positions for these academics if they are seeking to progress their careers and obtain secure / tenured positions within universities. For the individuals who do not want to take on (or are not competitive for) traditional tenured academic positions, many opt to leave universities to work in consultancy or often with their external partners. This can be viewed in a positive light, that highly trained scientists are leaving universities and may help to draw out research into practice through their non-academic positions. But there is a downside to this – universities are loosing these new academics that have developed the skills, expertise, and networks to help achieve research impact. Only once the institutional foundations are in place, will universities be able to retain the next generation of science-policy academics, and help create a new kind of science that society is calling for. This is a work in progress, and my co-authors and I hope to see institutional support transform over the coming years as the pursuit for research impact increases globally. You can read a blog about the paper by my co-author Albert Norström, and see the full paper here. Businesses are beginning to recognise that declines in biodiversity associated with their operations can be bad for business. That is, many businesses, indeed even the World Economic Forum, are starting to view biodiversity loss as a risk to business operations – threatening operational productivity, access to finance, regulatory compliance, and business reputation. A public signal of businesses acknowledging biodiversity as a material risk is when they make commitments to or account for their influence on biodiversity in sustainability reporting. In a recently published study in Conservation Biology, Dr Joe Bull and Professor E.J. Milner-Gulland and I, undertook an analysis of the current state of corporate biodiversity accountability. To do this we turned to some of the world’s largest companies – the Global Fortune 500, to better understand their global commitments and actions for biodiversity, as published through their sustainability reports. We assessed the sustainability reports of the top 100 of the 2016 Fortune 500 Global companies (hereafter the Fortune 100), to understand what commitments, activities, and biodiversity performance businesses are publicly disclosing. Of the top Fortune 100 companies, 86 have publicly available sustainability reports. We found that almost half (49) of the Fortune 100 companies mentioned ‘biodiversity’, ‘nature’, ‘species’, or ‘ecosystem’ in their sustainability reports. This could be as brief as a single mention in the context of other environmental issues (e.g., climate), through to a dedicated biodiversity chapter, with clear biodiversity commitment(s) and disclosure of biodiversity-related activities. Whilst this figure of 49 is impressive, when we took a closer look at which companies were making commitments that were specific, measurable & time bound, we found that only 5 of the Fortune 100 did so (Walmart, Hewlett Packard, AXA, Nestlé and Carrefour). For example, Walmart’s commitment: “To conserve one acre of wildlife habitat for every acre of land occupied by Walmart U.S. through 2015“. Beyond Walmart’s commitment, none of the remaining Fortune 100 had adopted quantifiable biodiversity commitments (e.g., no net loss or better), unlike the small but rising number of businesses outside of the Fortune 100. An absence of clearly defined corporate biodiversity commitments means that it is impossible to measure whether businesses are genuinely making progress in relation to managing their impacts and dependencies on biodiversity, and whether they are contributing to international goals to halt the loss of biodiversity. In comparison, there has been much greater adoption of science-based climate commitments made by companies committing to reduce carbon emissions in line with the Paris Agreement within the next decade. Twenty-four of the 49 companies that mentioned biodiversity made links with the biodiversity-focused Sustainable Development Goals (SDGs 14 & 15). This is far greater than the 6 companies that acknowledged the Convention on Biological Diversity (the international policy instrument for biodiversity). Although not intended as a reporting framework, the SDGs resonate with the private sector and are already clearly being used to frame their sustainability commitments and activities. The Fortune 100 companies that mentioned biodiversity disclosed a diverse range of activities that they are undertaking for biodiversity. Activities included managing or preventing impacts, protecting and restoring biodiversity, monitoring biodiversity, engaging and connecting people with biodiversity, and investing in biodiversity. These activities and areas of disclosure are far greater than the voluntary areas of biodiversity disclosure recommended by the Global Reporting Initiative. Forty-nine of the Fortune 100 companies disclosed information about their activities qualitatively, involving short case study narratives or general descriptions in sustainability reports. Only 9 companies provided quantitative performance indicators associated with descriptions. We did not find any companies that reported on quantitative outcomes of their activities for biodiversity (e.g., whether ecosystem condition improved, or species abundance increased), making it difficult to assess whether business actions are achieving positive outcomes for nature. How can we advance corporate biodiversity accountability? Our assessment of the 2016 Fortune 100 Global companies has revealed that big businesses are taking notice of biodiversity, but the commitments made, activities undertaken and information disclosed about biodiversity in sustainability reports are incredibly variable. There is clearly room for improvement, and in our paper we show how approaches from conservation science can help advance corporate biodiversity accountability. Frameworks (like structured decision making and the mitigation hierarchy), and approaches to indicator development (like Essential Biodiversity Variables and systems to measure state, pressure and response) can help the private sector clarify and measure their commitments to biodiversity. Also, scientific studies can help direct corporate action in conservation priority areas by avoiding impacting the most threatened species and ecosystems, and helping conserve the last of the wilderness areas. This study represents just the beginning of our applied research into corporate biodiversity accountability. Now that we understand how businesses currently treat biodiversity in their public reporting, we can work in a more targeted way with businesses to help them more rapidly advance their corporate biodiversity accountability. Some critical areas we are already beginning to work with business on include developing science-based corporate biodiversity commitments, and robust and relevant quantitative biodiversity indicators for business. With the “biodiversity policy super-year” of 2020 rapidly approaching, we believe that now is the time for conservation scientists to engage with and support businesses to play a critical role in setting the new agenda for a sustainable future for the planet, with biodiversity at its heart. The “one” biodiversity indicator to rule them all: an impossible quest? Many businesses seek to develop biodiversity indicators to inform business decision-making. However, nature is complex, and serious challenges exist to develop indicators that can cut through this complexity and display clear and simple measures of biodiversity through space and time that are relevant to business needs. Current approaches to developing biodiversity indicators for businesses typically start with questions like “what single indicator should we use for biodiversity,” “how can a biodiversity indicator be made as simple as possible,” or “what ‘off the shelf’ biodiversity indicators could be adopted to meet business needs”. While these are important questions, we believe a better starting point is to understand the business context for developing and using biodiversity indicators. More fundamental questions that should be asked first are: “how can I demonstrate what I have achieved in relation to my corporate biodiversity goal and objectives,” “what information is needed at different spatial scales to make management decisions,” “what does my audience need to know about my company’s biodiversity performance”? These questions promote a more fundamental understanding of the business context for developing and using biodiversity indicators. Good practice in the science community suggests that indicators should always have a purpose, to answer a question that should lead to some change in management. It could be that many of the indicators currently in use are therefore redundant, and companies could redirect valuable resources in terms of time and financing to developing and testing more relevant indicators. Differentiating between purpose, primary audience and spatial scale of assessment, we have currently identified a wide spectrum of applications of biodiversity indicators. For example, the 19 different applications identified so far range from biodiversity screening in pre-development at a site level for internal operations and environmental managers, to reporting on biodiversity performance of investments to external shareholders and lenders. These applications can and should lead to very different biodiversity indicators being developed to meet business needs. Several IUCN resolutions passed recently by IUCN Members at the 2016 World Conservation Congress frame the approach of this project. In particular, one group of resolutions focus on best practices and tools recommended for business. It includes a specific resolution on Strengthening corporate biodiversity measurement, valuation and reporting that calls on IUCN to “facilitate Members to join forces and collaborate with businesses to develop a common framework and set of principles on how to measure, value and report on biodiversity in order to improve, standardise and promote corporate biodiversity reporting”. IUCN and Oxford University have a shared interest in bringing the latest thinking from the conservation community and science to business. We have come together to clarify the variety of applications, where biodiversity indicators are currently used by businesses and may be adopted in the future. Biodiversity indicators will not be developed in the initial phase of the project. Rather, this project seeks to define the spectrum of applications where businesses use biodiversity indicators and clarify the purpose and intended stakeholders behind them. This first step will be used as the foundation for a recommended process to guide companies and conservation organisations in the development of fit-for-purpose biodiversity indicators where gaps have been identified. Like many working in this area, we believe that indicators should be developed in a robust way, and to be effective, their interpretation should always be simple. On the other hand, the construction of indicators need not be simple, it depends on the complexity of the system you are trying to understand and/or manage. Indicator construction is the domain of science and we plan to draw on the experience within the IUCN network and at Oxford University. Having spoken to several companies on this already, we know that they are eager to seek the advice of the applied scientists, who have the processes, tools and data to share. We hope our focus on how to develop relevant indicators as levers of change will make a unique contribution that can add-value to business. We look forward to working with others over the coming months to frame a process for business that will strengthen their decision making around biodiversity. About the authors: Prue Addison is a Postdoctoral Researcher and Natural Environment Research Council (NERC) Knowledge Exchange Fellow at the University of Oxford’s Interdisciplinary Centre for Conservation Science in the UK. Giulia Carbone is Deputy Director, and Nadine McCormick a Programme Officer, for IUCN’s Business and Biodiversity Programme, based in Switzerland. Decision triggers for evidence-based conservation management of natural systems: Research Papers & PhD opportunity! Many conservation organisations are striving to undertake evidence-based management to help guide effective management of natural systems. This is where the best available evidence, like ecological research or monitoring data, are used to support management decisions. 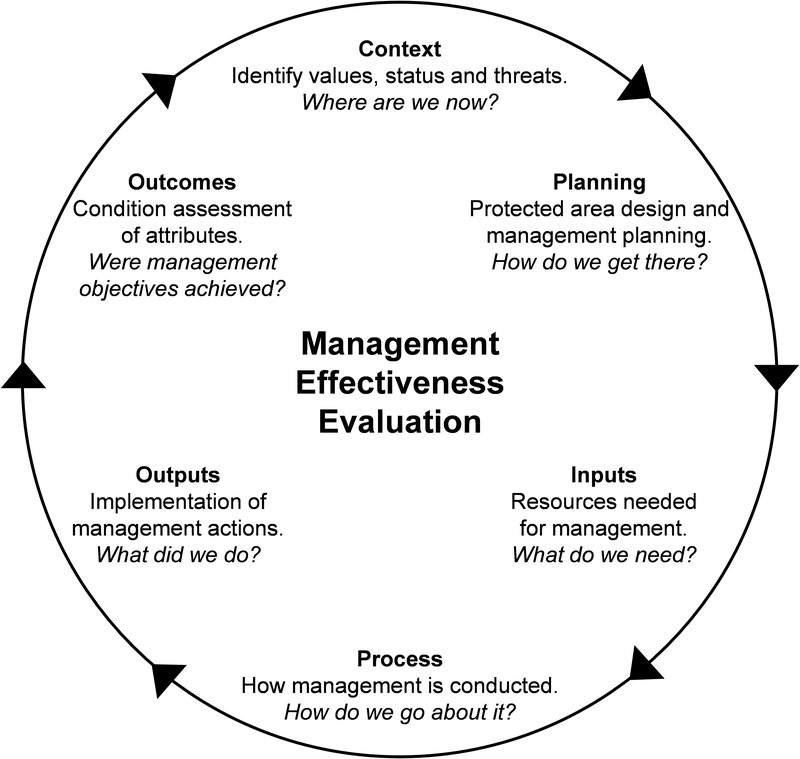 An important feature of evidence-based management is that it can assist conservation practitioners in making often difficult decisions about when to intervene in a system to prevent undesirable changes. Decision triggers are one approach that can be useful to help link monitoring data with management decisions. Decision triggers represent a point or zone in the status of a monitored variable indicating when management intervention is required to address undesirable ecosystem changes (Figure 1). Figure 1: Decision triggers (horizontal dashed lines) representing a target for management intervention. 1) The science behind decision triggers, and why conservation scientists are embracing the concept (see our Biological Conservation paper). 2) Conservation practitioners’ perspectives on the current use and potential future application of decision triggers for protected area management (see our Journal of Applied Ecology paper). 3) Guidance for practitioners to integrate decision triggers within existing conservation planning & management frameworks, and recommended tools to help develop decision triggers (see our final paper in the Journal of Applied Ecology). Figure 2. Exploring decision triggers for evidence-based management. Summary of 3 papers. Our studies have found that there is support from both researchers and practitioners for the use of decision triggers in the management of natural systems. However, setting meaningful decision triggers for management remains a daunting task. In our final paper, we draw on the depth of existing management, evaluation and conservation planning frameworks designed to promote adaptive decision-making processes, to illustrate critical stages to integrate evidence in decision-making, and highlight where development and implementation of decision triggers fits in. Importantly, we also identify a range of methods for setting decision triggers that are suitable for different management contexts (ranging from data-rich and data-poor environments, and decisions involving single vs. multiple management objectives). We believe that decision triggers can be integrated into existing frameworks, and if applied in practice will help fill a critical gap in evidence-based conservation – helping close the loop between monitoring and management action. To help continue this great collaborative project, we are offering a fully funded PhD scholarship to work with our team and led by Dr Carly Cook at Monash University. The candidate will undertake an innovative project investigating the development of triggers for management action, to guide decisions about when to intervene in the management of threatened species. Please see Carly Cook’s PhD opportunities page for more information. Many businesses are beginning to account for their impacts and dependencies on nature, through approaches like natural capital accounting. Whilst accounting approaches are well developed for some aspects of natural capital, other critical aspects like biodiversity are yet to be fully accounted in business decision-making. Many business leaders recognize the importance of accounting for biodiversity, but are currently grappling with how to distill and act on information about complex and dynamic natural systems that interact with all levels of their business. They are facing challenges like how to effectively measure, evaluate and act on biodiversity performance from site- to corporate-level. The field of conservation science has emerged as a discipline to address one of the greatest environmental challenges – the continued loss of biodiversity around the globe. This field of research is incredibly diverse and includes approaches to help protect, conserve and even trade nature. Across this spectrum of conservation practice, conservation scientists have been particularly effective at developing processes and tools that help governments and NGOs effectively measure, evaluate and act on biodiversity performance. The conservation science that can address business challenges already exists, but remains a largely untapped resource in Business and Biodiversity discussions. This week I will be attending the EU Business and Biodiversity conference, where I will be talking to participants about the potential for conservation science approaches to address Business and Biodiversity challenges. I’ll be helping facilitate the session on ‘how to set the ambition level’ for businesses, where I’ll be sharing some insights from conservation science that can help businesses begin to think critically about their ambition for minimizing impacts on biodiversity and contribute to global efforts to conserve biodiversity. To find out more about the conservation science toolbox that can help address the challenges that businesses are grappling with relating to measuring, evaluating and acting on biodiversity performance, read my latest KE@ICCS Brief Science note. You can also follow the EU Business and Biodiversity conference conversation from afar on Twitter using the hastags: #BBNC17 #EUbiodiversity. Decision triggers have received increasing attention from the scientific community, who have suggested that they facilitate more proactive and transparent management of ecosystems. However, there has been little consideration of whether practitioners in management organisations support the adoption of, or even use of decision triggers in practice. We are currently developing detailed guidance to provide practitioners with a clear understanding of how to integrate decision triggers within their organisations’ frameworks. This approach will be tested through a series of case studies to illustrate how decision triggers can be applied to managing species, ecosystems and threatening processes. If you would like to find out more about our upcoming research, and a PhD opportunity within this research programme, please contact Carly Cook. You are invited to join the interactive panel discussion and Q&A session, where panelist will share current ideas and best-practice, and debate the future direction of business’ contribution to the conservation of biodiversity. Please pass on the session flyer to anyone who may be interested.